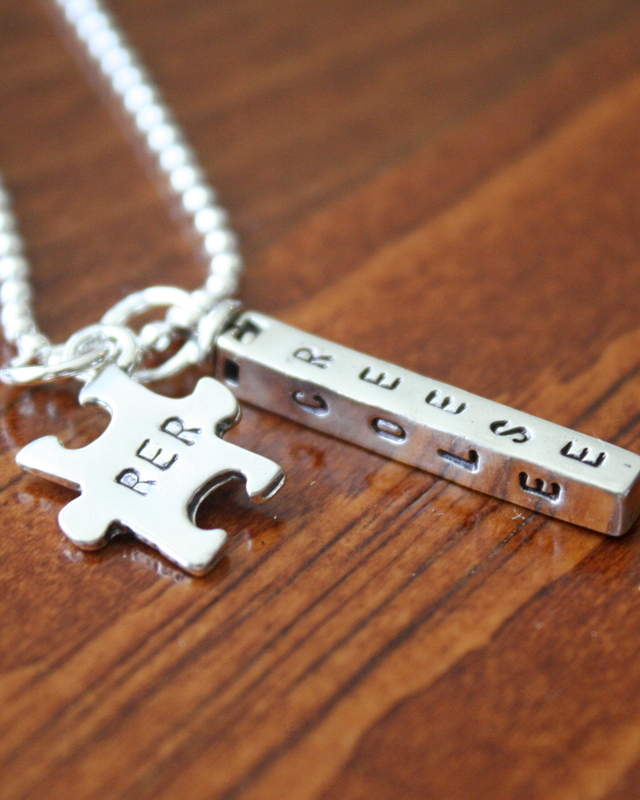 Autism Awareness Jewelry makes a great personalized keepsake necklace or bracelet gift. Be sure to check out K&S Impression’s Awareness Jewelry Designs to create a gift for yourself, a mom, dad, or grandparent of a special child with autism. 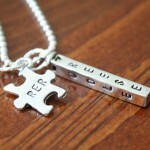 Personalize a name charm and add a Puzzle piece Charm or Awareness Ribbon to create your unique jewelry gift. Prior to starting K&S Impressions, Suzanne was a special education teacher and grew close to students with autism spectrum disorders. Her background and knowing research on autism revealed a tremendous rise in its incidence, this challenge is especially important to us. So, we were excited when we found a Puzzle Piece Charm and Awareness Ribbon Charm with multi-colored Swarovski crystals, to symbolize this special cause. When given the opportunity to create this necklace with our four-sided name bar charm, she added us if we could personalize the puzzle piece charm with her child’s initials. To be honest, at first, we weren’t sure the puzzle piece charm would allow us to stamp an impression. But, now after doing so, we are thrilled with how it turned out and feel it deserves to be shared. We are also kicking ourselves for not thinking to personalize the puzzle piece charm earlier! Breast Cancer Awareness Jewelry is a great gift keepsake gift for a special breast cancer survivor. In honor of National Breast Cancer Awareness Month, we are highlighting this special necklace. 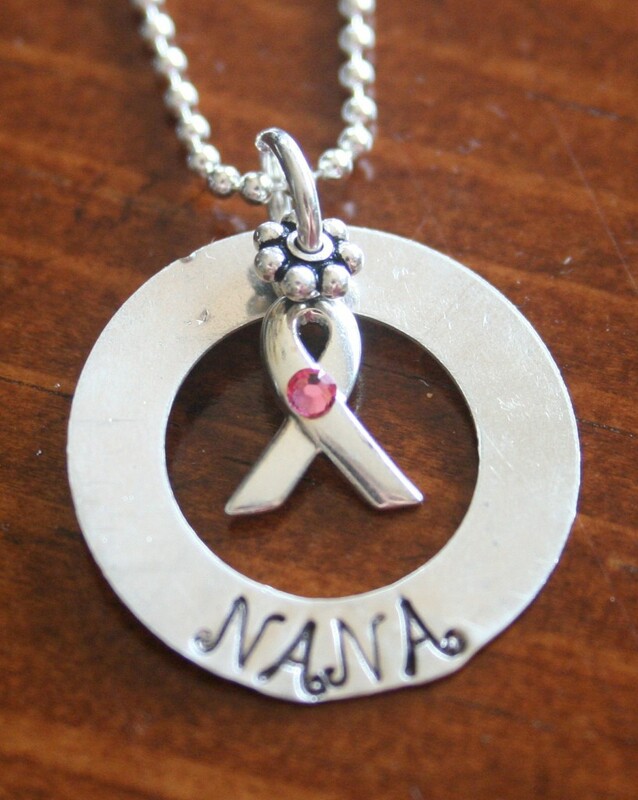 This custom personalized necklace was ordered for a special woman, stamped with “Nana,” from her grandchildren. This necklace features one circle Josephine necklace hand stamped with the name of your choice accented with an Awareness Ribbon charm and pink Swarovski Crystal. If you have a relationship with an organization that can benefit from our Giving Back Program, please contact us at kandsimpressions@gmail.com. We are currently forming partnerships with dedicated organizations, donating 15% of the proceeds made from the sale of our Awareness Ribbon & Support designs.